Everyday more Latinos are being diagnosed with diabetes and are struggling with renal failure. When the kidneys stop functioning, the consequences are devastating and the lack of treatment or an organ transplant can lead to death. There are over 800 Latinos in the State of Illinois currently suffering from this medical condition, who are struggling to survive while they wait for an organ donor who can save their lives. This is the case of the Rivera family whose lives took an unexpected turn when the doctors announced that Anthony, only seven years old, was experiencing renal failure. 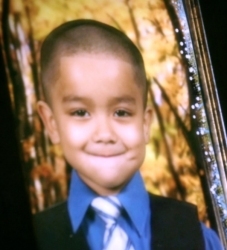 Josefina Rivera, Anthony’s mother, began noticing that her son was fatigued, his eyes were swollen and he did not want to go outside to play. She immediately took him to the pediatrician where the necessary exams were performed, and was told that he had kidney disease. The family immediately changed their activities and concentrated all of their attention on Anthony. Anthony’s sickness has escalated to the point that his teacher must home school him because the dialysis treatment forced him to trade in his classroom for a hospital. Josefina explained that her son receives dialysis every Monday, Wednesday and Friday. “One encounters many people who believe they cannot register to become donors because they have diabetes or any other illnesses, and this is not true,” explained Raiza Mendoza, Manager of Hispanic Affairs for Gift of Hope. “We should all register and leave it up to the doctors to determine what can be donated and what cannot when the moment arises,” concluded Mendoza.